The area served by this church is on the edge of Chichester and was formerly in the parish of Oving. A licensed room for worship is recorded in the 1851 religious census (SRS 75 p158), which was replaced in 1869-71 by a permanent church, designed by H Woodyer (WSRO Par 145/1/2/2) and costing £2640 (PP 125). By 1981, when it was declared redundant, it was in poor repair and though used for a time as a museum, it is now boarded up. The three-sided apse has traceried windows; elsewhere there are lancets, of which those in the nave have shafted rere-arches. 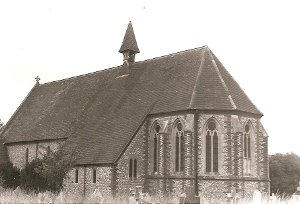 It is said (Elliott and Pritchard p42) to be almost identical to Woodyer’s Bayford church, in Hertfordshire. In the absence of a chancel arch, the screen becomes part of the structure. It has a central opening with two narrower openings each side that have elongated trefoil heads, which were a favourite device of Woodyer. Above is a large plain cross, ingeniously combined with the roof-timbers. On the roof above the screen is a wooden bellcote. This is unexpectedly small, but stands out because of the disproportionately large steep pyramid on top. At the join between nave and chancel on both sides are lower extensions. The south one is a Lady Chapel and the other a vestry. Woodyer designed many fittings, including a reredos (Clarke papers) which had gone before 1981, possibly in 1915, when W E Tower made alterations, including the screens and other fittings of the Lady Chapel (ibid). Font: Large square bowl on shafts. Probably by Woodyer. 1. (Chancel) The grisaille glass in the chancel windows is by J Hardman and Co, with whom Woodyer co-operated closely. It consists of medallions with a mainly blue background and a largely red patterned surround. The east one of 1871 is hidden. 2. (Lady Chapel) Two small, undated lights by Kempe and Co (dating from 1914 (Collins p312) and likely to be connected with Tower’s work in 1915). They have been removed to St George, Wyke. 3. (North nave) Kempe and Co, 1930. Reredos: This towering stone edifice was designed by R H Carpenter and carved by J Forsyth in 1867 for Chichester cathedral. It was moved to St Saviour, Brighton in 1904 and was brought here as a museum exhibit after that church was pulled down in 1983.